Free features for managing appointments and classes, clients and staff, and more for everyday health and wellness professionals. No hidden fees. No contracts. No obligations. Completely Free. The 100% Free business management solution for all health and wellness professionals. Use our innovative features for online appointment and class scheduling, staff management, client resources, auto reminders, and accept payments all from one place. Our online business management features include every tool you need to grow and manage your alternative health business. Use your online calendar to schedule, add, remove, change, or delete classes and appointments at anytime. Keep track of your staff by managing their schedules, time-off requests, wages, and more. Allow your staff to login individually to check their task list and schedule. Keep track of new and recurring clients by viewing their contact information, attendance record, outstanding payments, and upcoming appointments. Manage your business on-the-go with our mobile app, designed for smartphones and tablets. Stay connected anywhere to make important changes anytime. 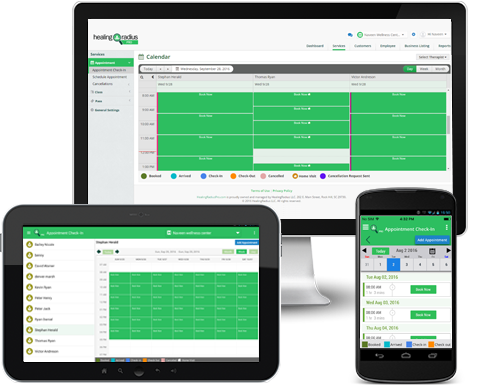 Manage your wellness center anywhere, anytime, on any device. Book classes and schedule appointments online, 24/7. Manage your staff and clients online. Maintain the profile page created for your holistic healing center.